I work specifically at the margins of the ceramics discipline, seeing how I can push our understandings of the field to open the space for craft art to operate. I use clay materials in different states of being in my final pieces to challenge and expand people’s perception of their surroundings and sense of belonging. 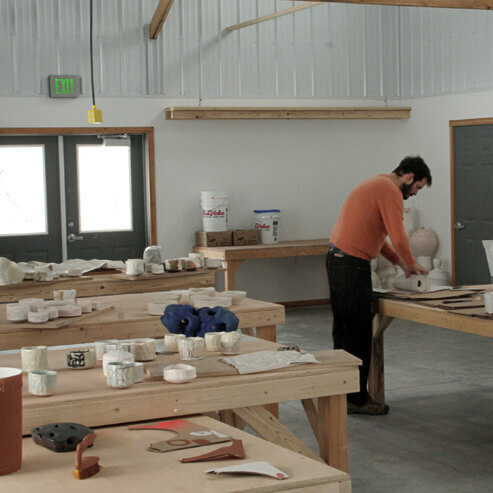 Fired ceramic objects relate to an implied sense of security through durability. Simultaneously my employment of moist clay and slip remind us that our own subjectivity and spatial relations are in flux. Appropriated objects remind us of our context, as beings among artifacts, with meanings and histories that are beyond merely our own experiences. Building/home improvement materials convey an aesthetic accessibility, a trace of people resolving the issues of their own comfort and desire, in a contemporary way. By fusing light with shadow, ceramic objects with the phenomenon of moist slip and an assortment of appropriated elements, I am conducting a study of the terms of our embedded-ness phenomenologically, linguistically and socially. My aesthetic hinges upon a minor de-contextualization of a thing or feeling so that it can be used an means for us to re-experience the familiar in a way that lets us see it again for the first time. The work is a studio based research practice, which allegorically employs the transformation of materials and conceptual nomadism to create objects and installations positing questions that are not rhetorically possible with rational methodologies alone. I seek to create a new thing from the combination of intent and process rather than simply reproduce preconceived ideas.